Ernst Hedinger, a Swiss clinical pathologist, came from Wilchingen, Canton Schaffhausen [though it is not clear if he was born there]. He studied under Theodor Langhans, the well-known German professor of pathological anatomy at the University of Bern, and qualified as a university lecturer there in 1905. By 1907 he was already a professor at the University of Basel and became Rector of the university in 1917. From 1922 to his unexpected death towards the end of 1924 he was head of the Institut fuer Klinische Pathologie at the University of Zurich. 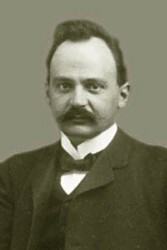 While in Zurich Hedinger focussed primarily on problems in pathology such as Addison's disease, the cause of goitre, arteriosclerosis, and tumours. During this time he also contributed to the emergence of neuropathology as a new area of specialization. His results were reported in dozens of publications from about 1900 onwards. At some time before or in 1915 Hedinger visited South Africa [and no doubt the Onderstepoort Veterinary Research Laboratories] and wrote a report on Pathological investigations into Lamsiekte (i.e., botulism; Pretoria, 1915). He concluded that, in cattle, the disease was caused by Sarcosporidia (an order of parasitic protozoa found in the striped muscles of warm-blooded animals). However, this conclusion is difficult to understand, as he found these parasites also in healthy cattle while he was in South Africa. Google scholar. http://scholar.google.co.za/ Publications by E. Hedinger. UniversitaetsSpital, Zurich. Institut fuer Klinische Pathologie. http://www.klinische-pathologie.usz.ch Search for Ernst Hedinger.